Remember that yarn crawl from a couple of weeks ago? Turns out I won the door prize at The Wool Basket that day. It’s a fabulous skein of Schaefer Nichole. Yummy. Lucky you! That is some pretty stuff right there….and what fun to win it as a door prize. Please tell me this posted early. I really can’t afford to lose a day this week. I haven’t knit with it, but I hear it’s delish! Enjoy it! I love the Schaefer colors. Which one is yours? Congratulations! Great way to go into a weekend. How interesting! 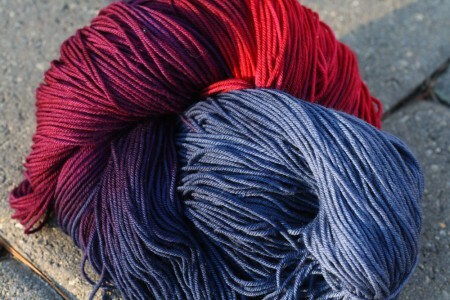 I just bought that very same yarn in that very same colorway at Wild & Woolly in Lexington! Lucky you to win it! I swear Carole. You are a magnet with these door prizes and blog prizes! What a great colorway! Have a great weekend. Happy Blogiversary…5 years! I didn’t see you mention it this week but I know we sarted within a few days of each other. Lucky you! Have a good one. Great win!!! What will you make with it???? I am passing on this plea in the hope that some yarn-aholics will feel generous. I am in desperate need of crochet hooks and/or yarn for a huge crochet club at school. I started it yesterday, and even with 27 hooks and skeins of yarn, I have kids waiting. I cannot invest any more (bank-o-me is already strained), so if you have any yarn especially and possibly crochet hooks, please let me know. Am willing to drive as far as Huntington and into Manhattan. Or, you can mail.